1950 Alexander "Mary Martin" doll, 14" doll in a white formal. "Mary Martin" was also produced in a sailor suit and a chambray outfit. 1950 Mary Martin "South Pacific"
Mary Martin, the American icon of Broadway and darling of Rodgers and Hammerstein, was the star of musical smash hit after hit launched by their collaboration. Although she made a number of films, she was devoted to the theater. 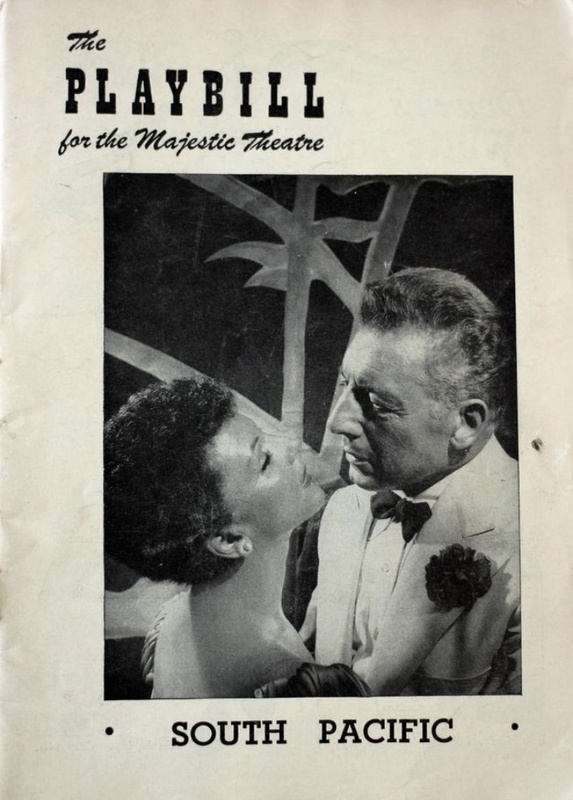 In 1948, Richard Rodgers and Oscar Hammerstein offered her the central role in "South Pacific." Nellie Forbush, singing "Cockeyed Optimist," "Honey Bun," "I'm Gonna Wash That Man Right Out-a My Hair" and, especially, "I'm in Love With a Wonderful Guy," became one of her greatest successes. The Broadway production of South Pacific was nominated for ten Tony Awards and won all of them. As one sign of her own fallibility, she often pointed to the fact that while accepting "South Pacific," "Peter Pan" and "The Sound of Music," she turned down the chance to be in "Oklahoma! ", "Kiss Me Kate" and "My Fair Lady." Mary Martin was an equally successful collaboration with Madame Alexander, and was translated in several costumes from "South Pacific." One of the interesting aspects of this particular doll is being misnamed in several books as being from "Show Boat." Pat Smiths "Madame Alexander Collector's Dolls" in 1978 and Marjorie Uhl's "Madame Alexander Dolls on Review" in 1981. This has caused much confusion over the years for collectors as to what the doll is representing. 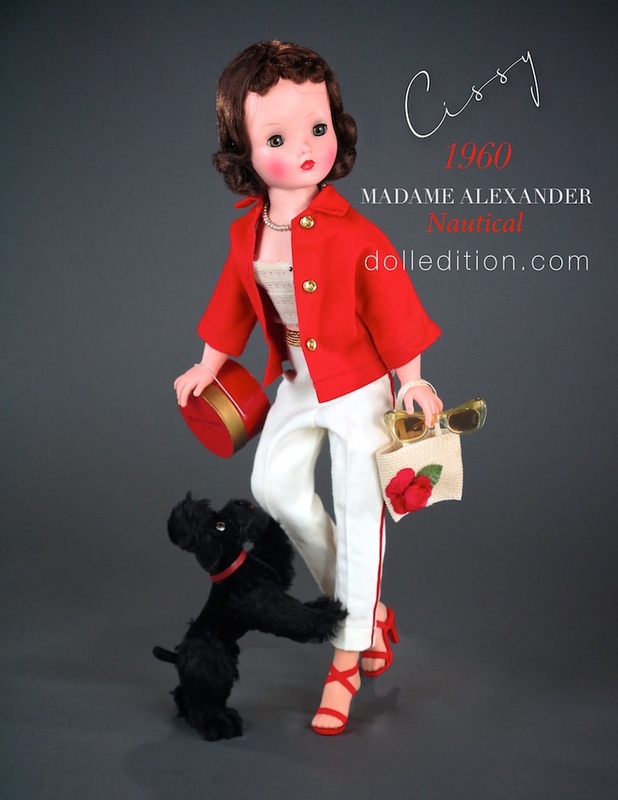 This doll was also produced in the time span that the Alexander Doll Company boxes were printed as "Madam Alexander" with the dropped "e."
!4 inch "Mary Martin" All hard plastic, Margaret faced with red caracul wig. White organdy over satin stress trimmed with green velvet bows. The doll has an original paper clover leaf wrist tag, and its original box labeled "Mary Martin". Top Left is the green string used this 1950, "Mary Matin." 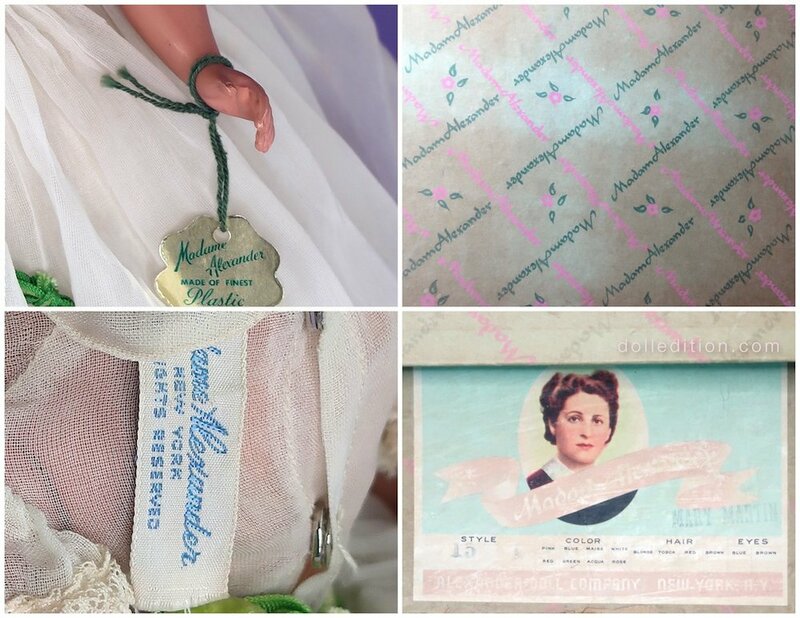 Top Right is the "Madam Alexander" box with the dropped "e." Bottom Left is the dolls "Madame Alexander" tagged gown. Bottom Right shows the company style number "15" for this "Mary Martin." South Pacific is a musical composed by Richard Rodgers, with lyrics by Oscar Hammerstein II and book by Hammerstein and Joshua Logan. The work premiered in 1949 on Broadway and was an immediate hit, running for 1,925 performances.